First, I’ll introduce you to a drawing that I didn’t upload in my blog before. It’s actually one of my favorites and I hope you like it. I think it fits with the next section of the entry. Palestinians went through a lot, starting with ethnic cleansing to the series of violations of their rights, to the daily attacks on their land and their people, and so on. However, Palestinians maintain their determination believing in victory, justice and peace. They always have a bright look full of hope towards a better future where humans are treated like humans, even in their crying eyes. I meant to highlight some symbols in the wood “background” such as 48, the key, and the map of historical Palestine, to convey a message that we will not give up. Despite many people thinking that these are only illusions, and that one-state solution is not feasible, I still believe that just peace will inevitably come along. While preparing my assignment for the translation course at university, and being busy with translating texts from Arabic into English and vice versa, I came across an Arabic poem entitled: “They Asked Me”. I fell in love with this poem and I tried to look up its author, but I found nothing. It describes Palestinians and their long decades of struggle against the Israeli Occupation. I see the strength of Palestinians, especially prisoners, portrayed in this poem very simply. It embodies their dignity, challenge and steadfastness in front of the tyranny, oppression, humiliation, injustices committed by the Israeli Occupation. I think it is worth the time it took me to translate it. Enjoy. They have left me homeless and said that I was “fantasizing”. This entry was posted on January 26, 2012 by Shahd Abusalama. It was filed under My Drawings and was tagged with Drawing, Israel, Israeli Occupation, justice and peace, Palestine, peaceful resistance, Shahd Abusalama, steadfastness. Thanks friend. I’m glad you like it. We’ll overcome inshAllah! Reading the poem and understanding the struggle of the Palestinians reminds me of the past struggles of my people in Ireland. I think of quotes by Bobby Sands, an Irish political prisoner who died on hunger strike in the 1980’s, and how they can be equally applied to the Palestinians. They have nothing in their whole imperial arsenal that can break the spirit of one Irishman who doesn’t want to be broken. Bless you Shahd and all the Palestinian people, may you all see the rising of the moon soon. Shahd, you are an inspiration to me and many activists for Palestine in America. 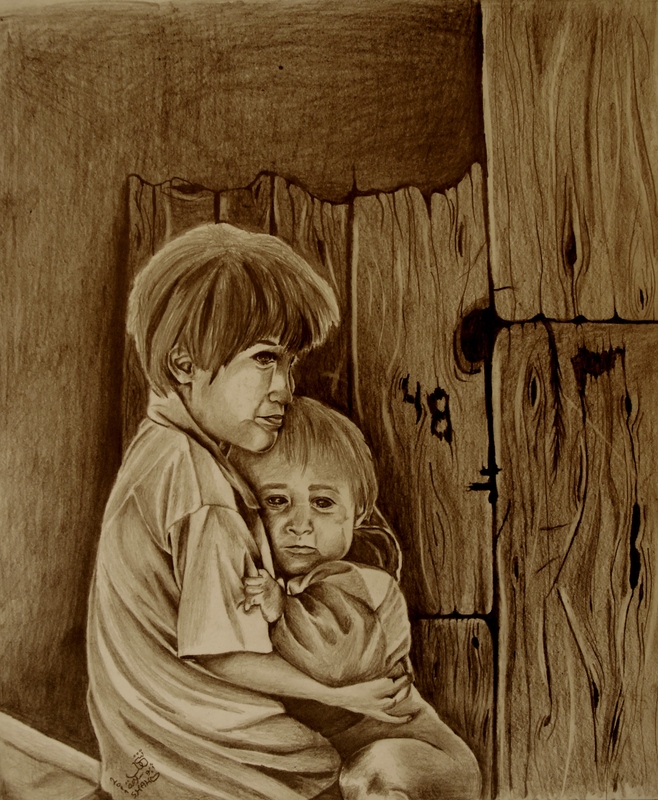 Your beautiful and meaningful art capture the spirit of Palestine in all its glory. Please know that we share in the pain and suffering of our Palestinian family and pray for the day when all souls there will be free from oppression and cruelty. You have gained our hearts and our attention….for me, it means that part of me remains in Gaza as my heart and spirit refuse to leave my brothers and sisters alone for even a moment. The stories and artwork you share are priceless and have helped form a bond between us and Palestine that will never be broken. We are now your family and Palestine is our child that we love and cherish with all of our hearts. We will never forget you and will continue to demand freedom and justice for our brothers and sisters of Palestine. Thank you for sending your sacrifice of love to us across the oceans…The beauty, love, and dignity of Palestine will endure forever. I send you love and blessings of peace, my dear little sister! I am glad to have discovered you (I’ve just added you in facebook). I think Arabic a beautiful language and I hope I’ll learn some day. May you, please, add the original Arabic version to help me train my (still poor) Arabic? Thanks for your comment. Arabic is a beautiful language, so rich! Good luck with learning it. Here is the Arabic version. Great poem and great drawing… I love Palestinian poetry (translated into English) so I hope you will consider posting more poems..
and I also like your new blog, the lay-out is much better. Thanks dear :) I’m glad you like it!